Halloween has Irish roots; it is the descendant of the pre-Christian Celtic New Year’s Eve Samhain. At Samhain, the veil between the world of the living and the world of the supernatural was believed to be at its thinnest, meaning that all sorts of ghouls and goblins could pop over for a visit and terrify people. While the cute little leprechauns get all the attention, Ireland is also home to a couple of Celtic creepy creatures that you won’t see featured on a lot of Irish gifts! The Banshee is the most well-known and most feared, and her visits are not confined to this time of year. No one wants to hear her wail because it warns of an approaching death. She doesn’t say who is nearing their end, so everyone is terrified. Much better to assume that howling is just the wind! Seeing her is confusing because she can take on many forms. 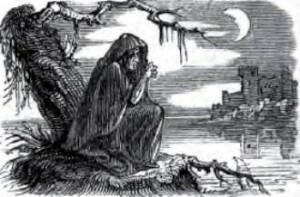 The Banshee can appear as a gorgeous lady or a toothless old woman – but you would know her by her long, flowing silver hair and her hideous cries. The Puka has an unpredictable temperament and appearance. Some of their favorite forms are those of rabbits, goats, horses and bulls. They can also appear as elves. They are occasionally even kind and helpful, but mostly they play tricks. Pukas are the original trick or treaters because if you give them little treats, they won’t play tricks on you. Of course, Samhain season is also the time for the restless spirits of the deceased to pay a call. These are rarely happy souls. Those who return generally have some unfinished business with the living, even if the living they haunt are the descendants of those with whom the spirit quarreled or simply live where the spirit’s long dead adversary once did. The spirits might have a score to settle or a broken heart, both of which make it tempting to offer them treats. Our ancestors, however, did not greet them with a cead mile failte or welcoming Irish gifts. They carved vegetables into jack o lanterns with hideous faces to out-spook the spooks. While Ireland is generally viewed as a friendly, welcoming destination, at this time of year it is especially noteworthy how many of our most popular tourist spots are actually graves. Beautiful Newgrange in County Meath with its stunning spiraling carvings is a passage grave. The ancient dolmens in County Clare and elsewhere are also graves. The Croppies Acre in downtown Dublin is a mass grave. Famine graveyards dot the countryside, and in Dublin, Glasnevin Cemetery now includes a visitors’ center. A warm welcome is one of our trademark Irish gifts, but don’t be too surprised if you also feel an occasional chill down your spine while in Ireland, especially at this time of year. While we see a lot of visitors from around the world, it just might be that we also have plenty of visitors from the spirit world.